Today , LG Electronics has launched its new optical storage innovation called “Millenniata” which can keep the information stored for more than 100 years without suffering from adulteration and the LG Optical devices are designed to work with M-DISC TM. The new LG Optical device technology uses M-DISC’s DVD-R discs which has the harder surface recording and is burned by one of the powerful laser which leaves the information unchanged. The M-Disc uses the patented recording surface instead of organic eye to etch your records. 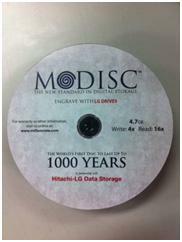 The unique materials used in the M-Disc require a new disc drive technology to engrave data on the surface. The M-Disc and the LG Super Multi-drive has been designed and optimized to work as one to scratch data into the permanent synthetic stone layers within the M-Disc.